As a Filipino, I'm proud to announce that there's another Filipino-American baller who got drafted in the NBA. He is the 6'5 point-guard out of the University of Missouri Jordan Clarkson. 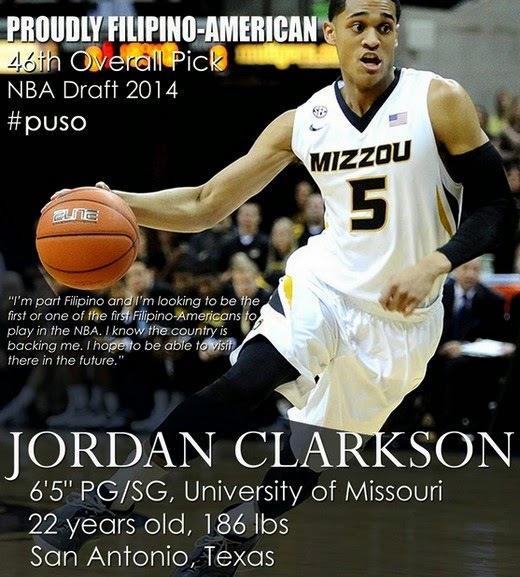 Following the footsteps of the so called pioneers, Raymond Townsend (Fil-Am who got drafted in 1978) and Ricardo Brown (Fil-Am drafted in 1979), Jordan Clarkson became the third Filipino-American NBA draftee. The 46th overall pick of the Washington Wizards in the NBA Draft 2014, Clarkson got traded to the LA Lakers. But still, on a lighter note, he is now part of the Draft Class that might go down in NBA History as one of the best group of guys who ever played in the highest level of Basketball Competition.